The Memory Book by Lara Avery ended up being an incredibly quick book to read that was emotional but not overwhelming. I'm glad I gave it a chance and I loved how sweet the book ended being. 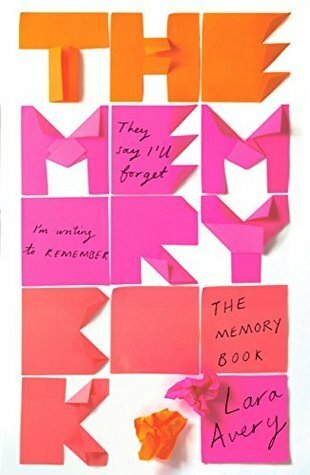 I was a bit conflicted about reading The Memory Book by Lara Avery. The cover itself makes it look like a book I'd want to pick up and flick through... but once I found the story revolves around 17 year old Sammie with a rare disease, Niemann-Pick Type C, a genetic disease similar to dementia in which Sammie will slowly lose her memory as well as other cognitive functions, I was a little less keen. Only because a member of my close family suffers from dementia and I worried that this book would feel like too much. Luckily for me, this book is very readable. There were moments of heart-break, but the overall tone of the book is very positive and hopeful and that comes across very well within this book. It's essentially Sammie's diary as she tries to make sense of this condition she's living with, trying to record the important events but also as she's trying to work towards her goals, her new relationship and the rest of her life as it is becoming. I think the fact that Sammie is quite young and dealing with this disease and also her character's approach towards it made it far easier to read her experiences. Yes, she's going through something awful, but she has such a good attitude about it that it felt harder to feel sorry for her and I think even her denial that she might not achieve some of her goals is what helped create some distance in the emotional aspects of the story line. Because Sammie is such a driven character. She's determined to do All The Things: win the national debate championships, be valedictorian, go to New York for university. She realises that Niemann-Pick will affect her life in some ways but she's determined to live out her goals anyway. I also enjoyed her burgeoning friendship with ex-friend, Cooper, and new love interest, Stuart. It was nice to see that this book was very much about the experiences of a teenage girl with romance and troubled friendships. I loved everything else going on in Sammie's life. But I think ultimately what I enjoyed the most about this book is that it is a very life-affirming story of hope and love and slowing down and treasuring the things most important to us.